It’s been roughly four months since Intel first announced its brand new family of high-end desktop Skylake X parts and just over three months since the company introduced the first batch of Skylake X parts into the market, which were based on the LCC — Low Core Count — die featuring up to 10 CPU cores. It has taken Intel a little longer to roll out its higher core count Skylake X parts based on the HCC — High Core Count — Xeon die, which many have speculated were never actually planned for the desktop although AMD’s Ryzen Threadripper launch has seemingly forced Intel’s hand. After all, the i9 7980XE’s only job is to dethrone AMD’s 1950X which is currently the most powerful desktop processor you can buy. The Core i9 7980XE also only happens to feature two more cores than AMD’s 1950X, go figure. Intel’s HCC based Skylake X parts will officially launch next week on the 25th of September. These include the 14 core i9 7940X, 16 core i9 7960X and 18 core i9 7980XE. Although as is always the case with these launches, someone somewhere out there managed to get their hands on Intel’s big daddy chip early and proceeded to benchmark the snot out of it and we’ve got the numbers for you. We’ve got two batches of benches for you, focused around productivity and gaming. 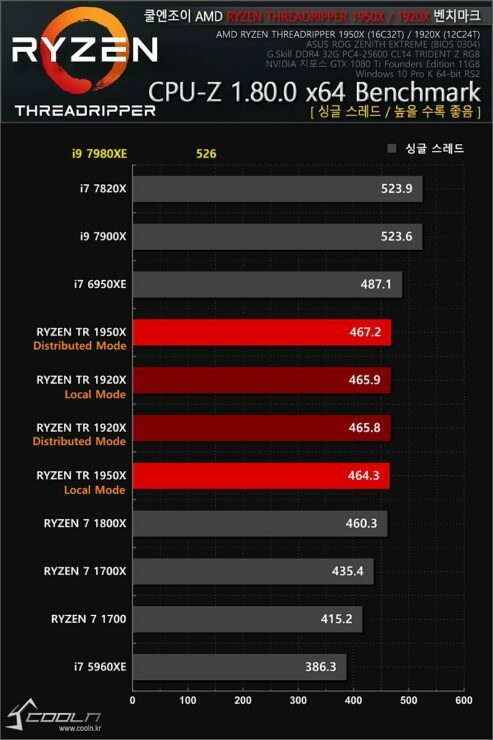 The benchmarks are courtesy of coolenjoy.com and picked up via VCZ. So let’s start with the productivity side first, if you’re dropping $2000 on a CPU you better know this is what you’re going to be using it for. wPrime is a synthetic benchmark for x86 processors that tests performance by calculating square roots with a recursive call of Newton’s method for estimating functions. The bigger the number the more multi-threaded the test gets owing to its method of confirming the results. As such the 32M figures could be seen as a representation of a lightly threaded workload while the 1024M results are for a heavily threaded one. 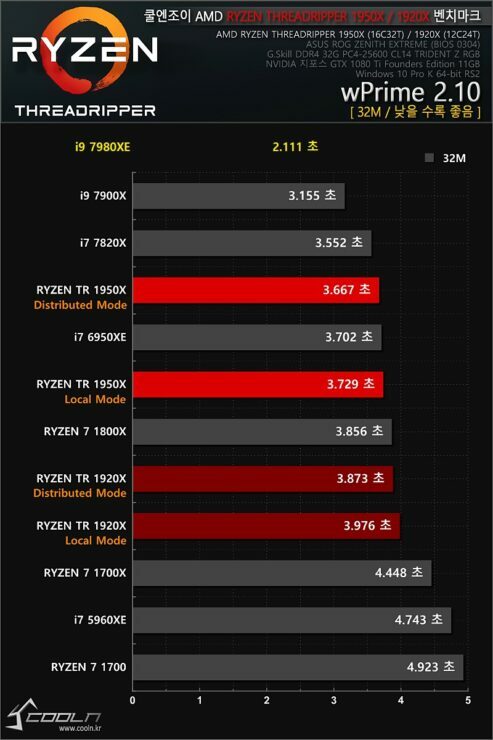 In either case the i7 7980XE comes out on top, outperforming all other parts by at least 30%. CPU-Z is another synthetic benchmark that includes both multi-threaded and single-threaded tests. 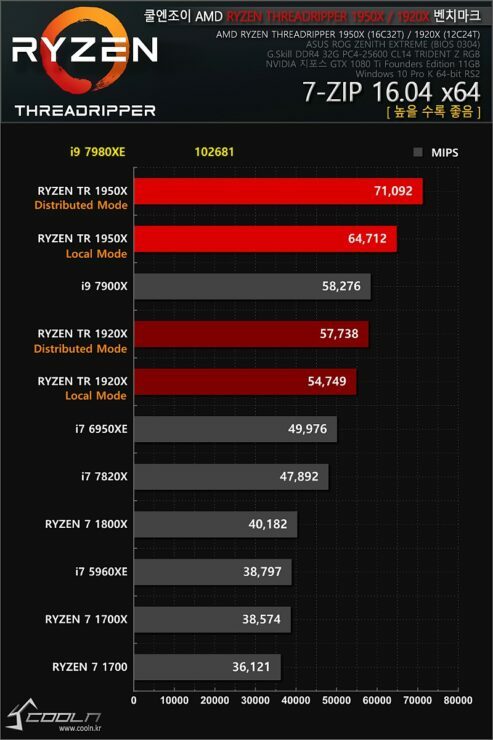 Surprisingly, the i9 7980XE manages to outperform the core i9 7900X, despite having the same 4.5GHz Turbo Max 3.0 clock speed although the numbers are within the margin of error, so we’re going to gloss over that and move over to the meatier part of the test, the multi-threaded portion. 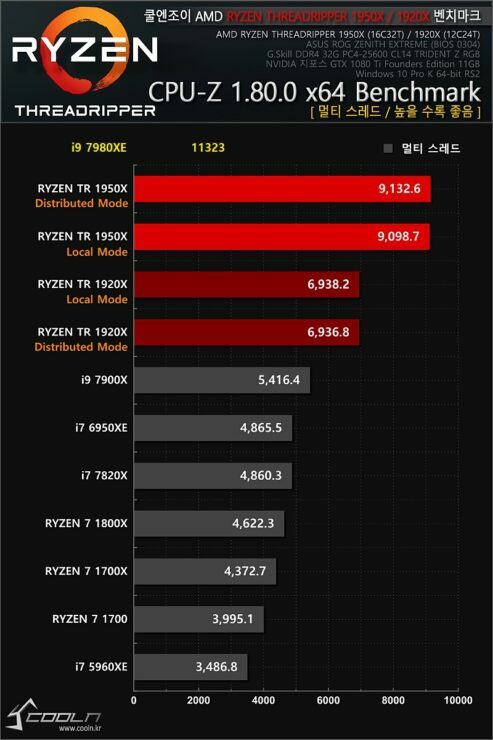 Here the i9 7980XE scores 11323 points, putting it roughly 20% ahead of AMD’s 1950X and making it the first desktop processor to over score over 10 thousand points. Moving on to CInebench r15, a favorite of AMD’s. 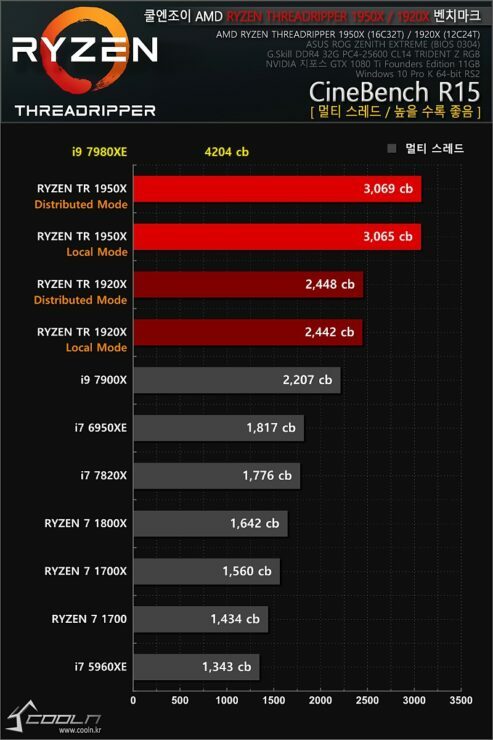 Here the 7980XE matches its other Skylake X siblings in single-threaded performance but delivers nearly double the multi-threaded performance of the 10 core 7900X and outperforms AMD’s 1950X by nearly 37%. The 7-Zip benchmark is is a purely multi-threaded test, although there are two components to it to evaluate compression and decompression performance. Compression tends to favor Intel, while decompression tends to favor AMD. The scores above fall in line with the figures we would normally see in the combined test, which includes both compression and decompression. 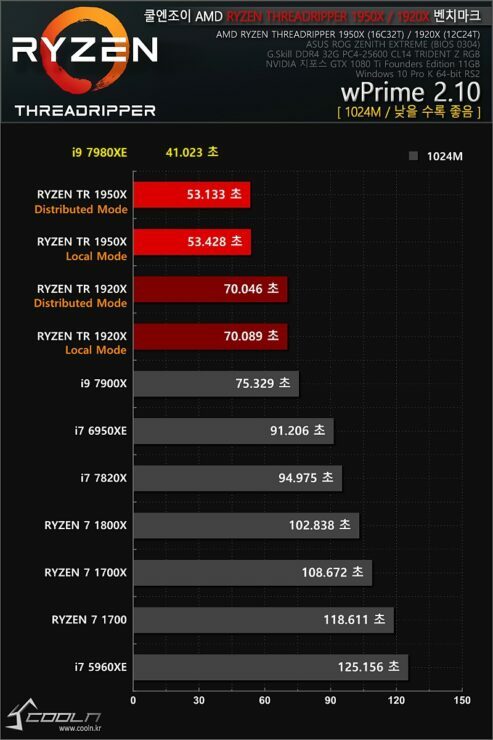 Here, the i9 7980XE outperforms the Threadripper flagship by no less than 30%. 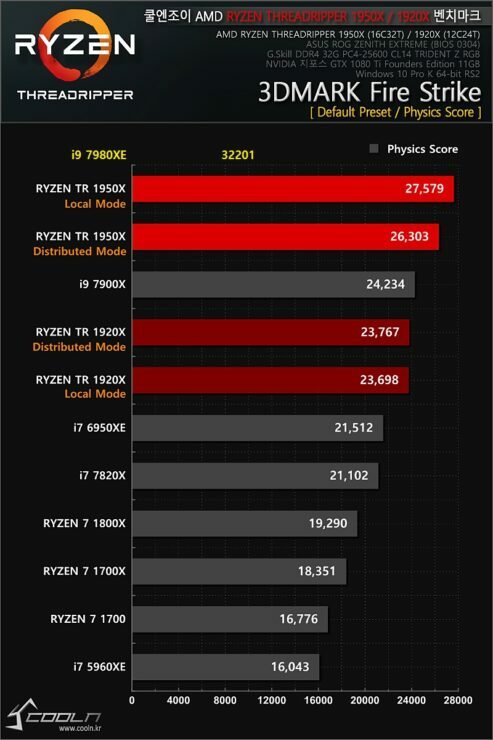 The last synthetic test we have is 3DMark Fire Strike and naturally we’re only looking at the physics scores since we’re talking about CPUs and not GPUs. The Core i9 7980XE scores 32 thousand points, the highest score we’ve seen from any desktop processor ever, earning it a 17% lead over AMD’s flagship. Moving over to the second batch of tests, we’ve got performance numbers for Player Unknown’s Battlegrounds, which is currently the most actively played game on Steam by number of concurrent players. 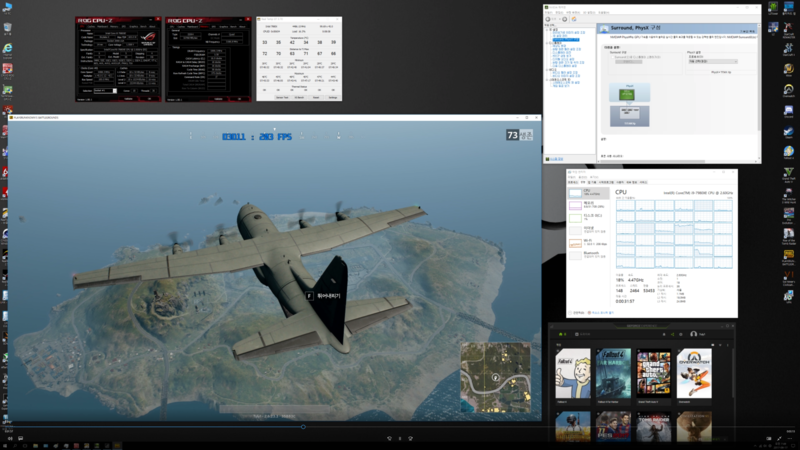 The Core i9 7980XE was paired with an NVIDIA GeForce GTX Titan Xp and compared against AMD’s Ryzen 7 1800X and the Core i7 7700K running the game at a resolution of 2560×1440 in five different locations. 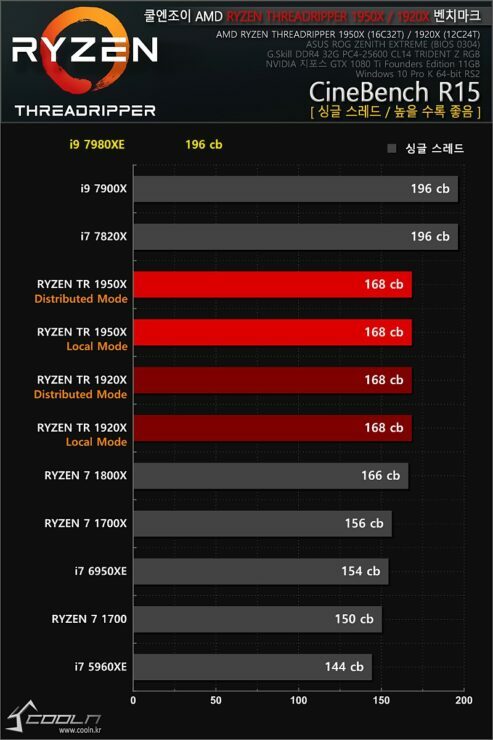 The 7980XE delivered a framerate higher by anywhere from 20% to 150% at any given time compared to the 7700K and 1800X. Although this includes some maximum FPS spikes, on average the 7980XE delivered around 30% better performance overall. So there you have it folks, as it turns out a two thousand dollar CPU is really fast, go figure. Whether it’s worth that hefty price tag or not is subject to debate however. And as always, remember to take these numbers with a grain of salt until the full proper reviews are out. The NDA is expected to end next week on the 25th.